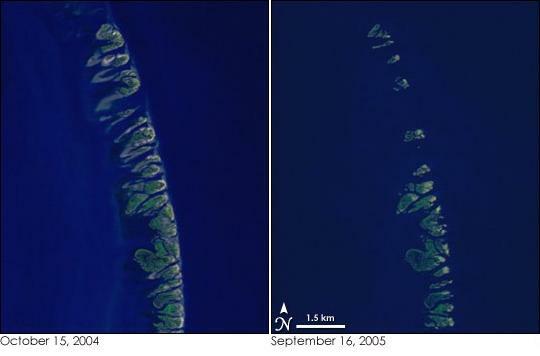 Two images of the w:Chandeleur Islands off the coast of Louisiana, USA. The left image is from 2004 and the right is from 2005, after Hurricane Katrina. Jesse Allen, NASA Earth Observatory, using data provided courtesy of Laura Rocchio, NASA Landsat Project Science Office. Other versions Original sample and larger, uncropped versions of images from both dates available at source URL.